The start of the Great Patriotic War on June 22nd, 1941, triggered serious corrections to both Soviet and German tank building. The fighting in 1941 showed that the time of light tanks is coming to an end. At the same time, the increasing mass of more and more powerful anti-tank weapons limited their ability to be transported by their crews. The abilities of the German PzI Ausf. B tank were limited, and it was impossible to create anything more powerful than the Panzerjager I. It's not surprising that the Germans came up with the idea to create SPGs using the chassis of other obsolete light tanks. 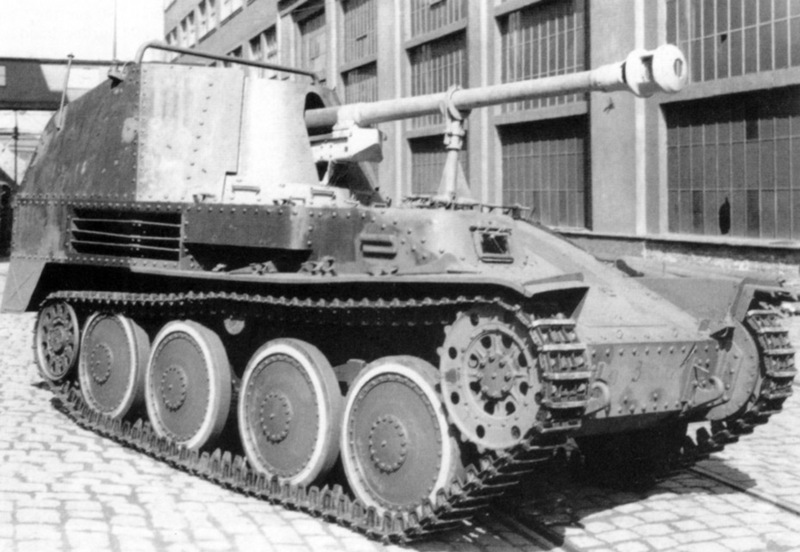 This article will discuss the family of Marder III tank destroyers, which were built on the chassis of the Pz38(t). The situation with the Pz38(t) in 1941 could be called critical. This tank was technically classified as light, but in practice these types of tanks performed the same tasks as the medium PzIII. It's not surprising that these tanks suffered record losses. 772 tanks were present in the German army as of June 22nd, 1941, and 796 were destroyed by the end of the year. No other German tank came close to this "record". It was clear that the career of the Pz38(t) was coming to an end. At the same time, there were no issues with the chassis. Out of all light tanks produced in Germany and on occupied territories, it was the product of the BMM factory (CKD before the occupation) that showed the most promise. The size of the chassis and the capabilities of the suspension allowed the vehicles to be converted into SPGs with relative ease. Pz.Sfl.2 from the 1st production batch, spring 1942. The gun travel clamp, which broke down often, can be seen. 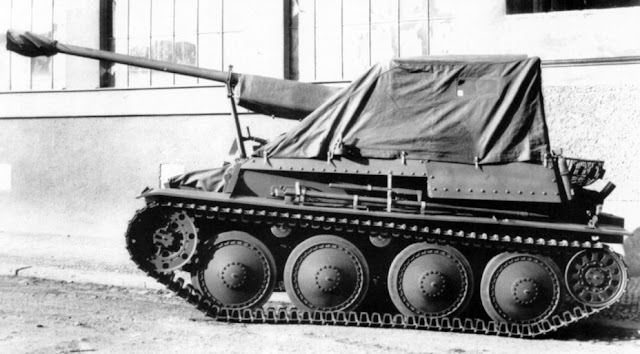 A decision to design a tank destroyer using the Pz38(t) chassis was made on December 22nd, 1941. In 6 (Inspekteur für Heeresmotorisierung, Inspector of Motorized Forces) gave the order to the 6th Department of the Armament Directorate only two days after an analogous program using the La.S.138 (PzII Ausf. D and E) was launched. 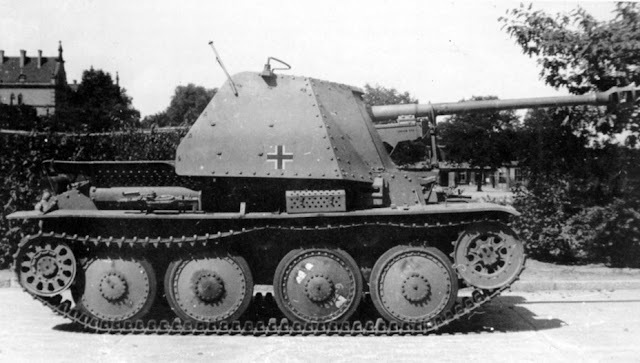 Like the 7,62 cm Pak 36(r) auf Fgst. Pz.Kpfw.II(F) (Sfl. ), the requirements were hard to meet. Since the SPG was needed as soon as possible, changes to the chassis had to be minimal. The requirements were sent to BMM, which was also instructed to produce a prototype. The same vehicle from the rear. The design of the fighting compartment allows the vehicle to carry additional ammunition crates in the rear. The task of converting the gun was given to Rheinmetall-Borsig, who was also working on the 7,62 cm Pak 36(r) auf Fgst. Pz.Kpfw.II(F) (Sfl.) at the time. It is not surprising that the gun mount for the new SPG was very similar. The oscillating part was taken from the Pak 36(r), which was made by converting captured Soviet F-22 guns. 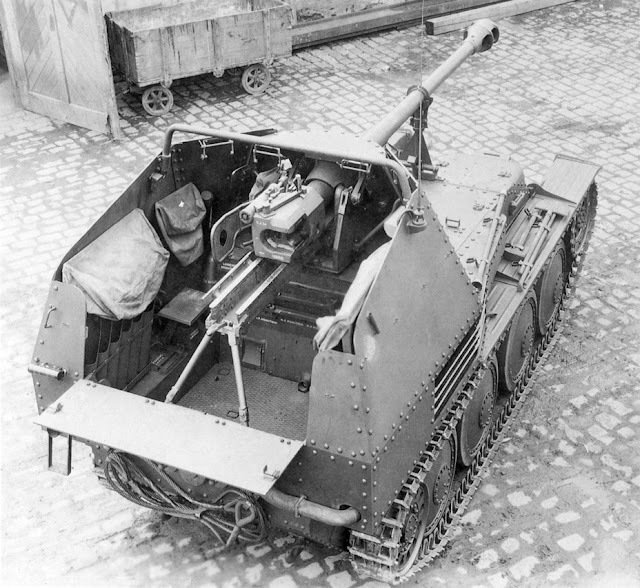 In addition to new ammunition, the Pak 36(r) had an altered aiming mechanism, a telescopic sight, and a muzzle brake. 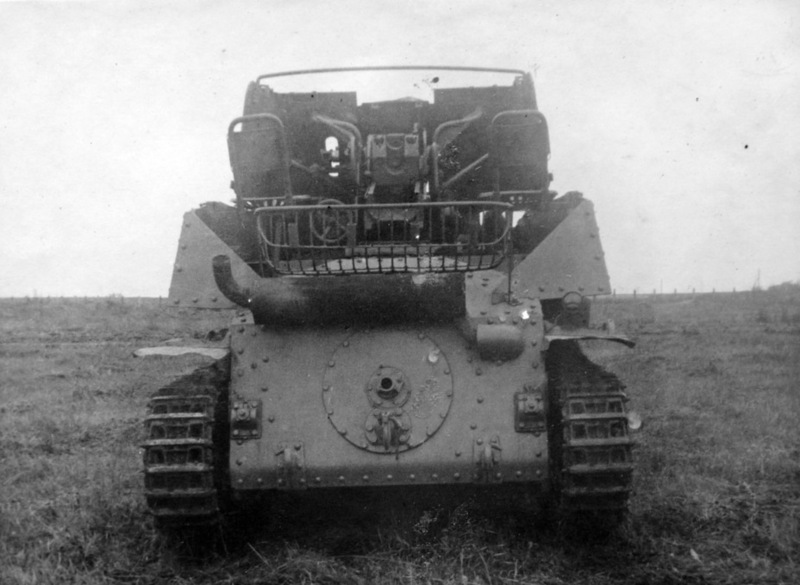 A gun shield was added to protect the crew not only from the front, but partially from the sides. 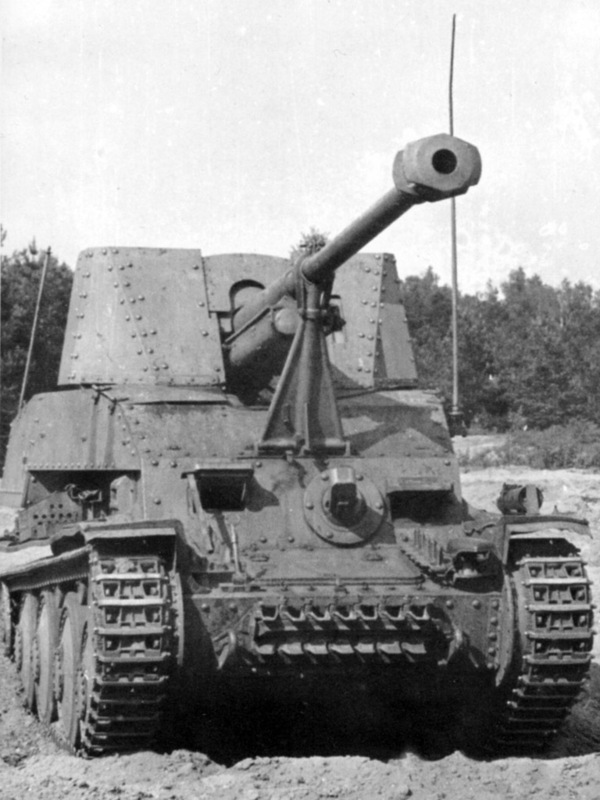 The design of the shield was almost identical to that of the 7,62 cm Pak 36(r) auf Fgst. Pz.Kpfw.II(F) (Sfl. ), but with the difference that the plates were joined by rivets. This was because BMM was not yet capable of welding armour. A second production batch vehicle is easy to distinguish due to a new gun clamp. BMM's designers had a tough job with the chassis. As the requirements demanded, the Pz.Sfl.2 had to retain the old chassis design. Even the turret platform was preserved (sans roof). The designers were faced with the same issues with this conversion as with the La.S.138. The layout with a central crankshaft made matters more complicated. The designers were forced to make a massive cross-shaped mount and attach it to the front plate and sides of the turret platform. More armour was added to the sides and front in addition to the armour of the turret platform. Like with the tank destroyer on the La.S.138 chassis, the fighting compartment was partially on top of the engine deck. This photo shows how the tarp is attached. It's hard to call this solution ideal, since the overall height grew to 2.5 meters. Nevertheless, BMM performed better in their task than the team that designed the 7,62 cm Pak 36(r) auf Fgst. Pz.Kpfw.II(F) (Sfl.). For starters, accessing the engine was easier. Removing the gearbox was still a difficult task, however. The position of the driver and radio operator was also better. They had their own hatches and did not have to crawl through the fighting compartment to access their stations. The space underneath the gun was also used more rationally, keeping 30 shells close to the loader and gunner. The mass of the vehicle was 10.8 tons, almost a ton less than the analogous vehicle on the chassis of the La.S.138. Finally, the bore axis was 20 cm lower, which improved stability during firing. Pz.Sfl.2 für 7,62 cm Pak 36 from the third production batch. Contract #219/326/42H for 120 Pz.Sfl.2 was signed with BMM on March 6th, 1942. The expected rate of production was as follows: 24 by March 24th, another 16 by March 31st, 70 by April 28th, and 17 by May 5th. The contract for 500 Pz38(t) tanks remained in effect. Despite that, BMM managed to fulfil most of the March quota: 33 Pz.Sfl.2 were made. The issue was not with production of the chassis, but with shipments of guns. The supplies seriously impacted the production in April. instead of 70 units, only 35 were shipped. Officially, all of these SPGs, including the March production, were accepted in April. 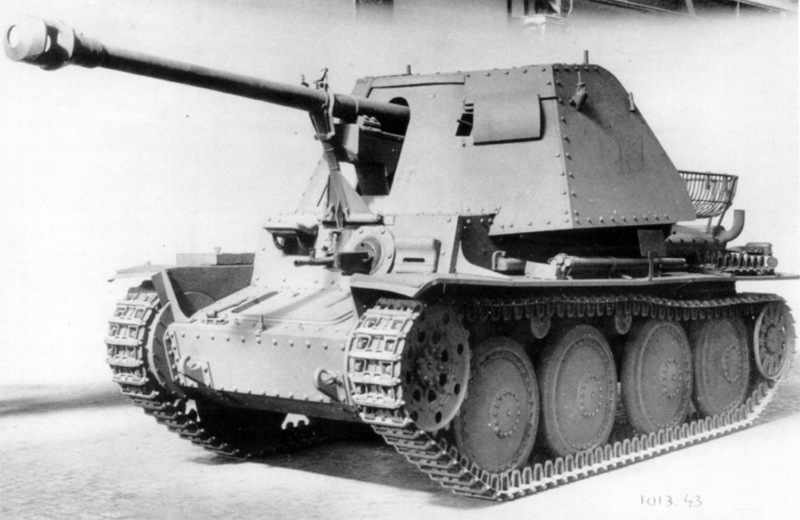 This is when the name 7,62 cm Pak 36(r) auf Fgst. Pz.Kpfw.38(t) (Sfl), "76.2 mm Pak 36(r) gun on a Pz38(t) self propelled chassis", was used. The remaining 52 SPGs were delivered in May of 1942. Some of them were built as tropical variants. According to proud German tradition, the SPGs were renamed constantly. 5 different names were used in 1942 alone. The name Pz.Sfl.2 für 7,62 cm Pak 36, first used in July of 1942, was the most commonly used one. The index Sd.Kfz.132 was also applied around this time. Pz.Sfl.2 für 7,62 cm Pak 36, converted from a refurbished Pz38(t). Production didn't stop here. 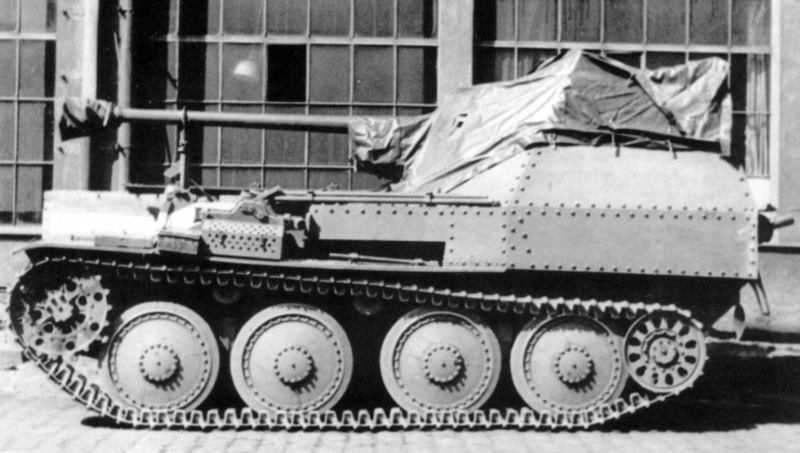 At a meeting on May 7th, 1942, Hitler declared that the Pz38(t) was obsolete. Tank destroyers should be built instead of these tanks. 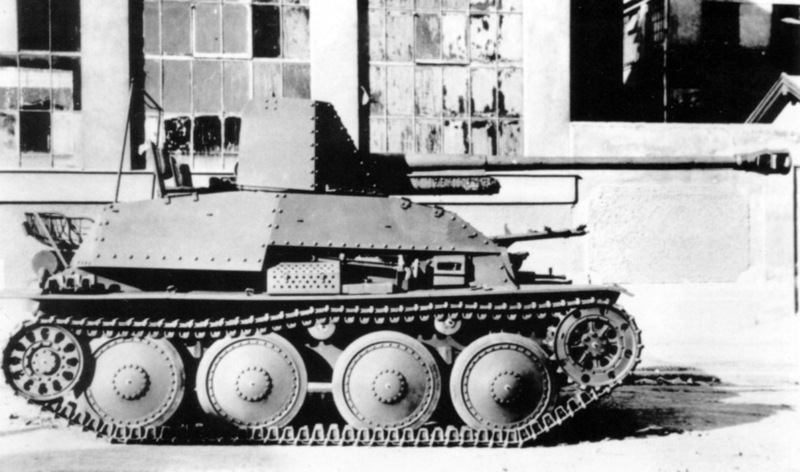 At a meeting on May 13th, it was decided that at least 20 Pz.Sfl.2 für 7,62 cm Pak 36 should be built every month. The final decision regarding the future of the Pz38(t) was made on June 4th. The order for the second batch of tank destroyers was made on that day, and regular tanks were removed from production. Their chassis would be used to make SPGs. 26 Pz38(t) tanks and 23 Pz.Sfl.2 für 7,62 cm Pak 36 tank destroyers were delivered in June. The tanks of the second batch were slightly different from the first. A small change allowed the gun depression to be increased by 2 degrees. The travel clamp was also converted. All SPGs built in June had tropical equipment. Another 50 Pz.Sfl.2 für 7,62 cm Pak 36 were built in July, the remaining 27: in August. 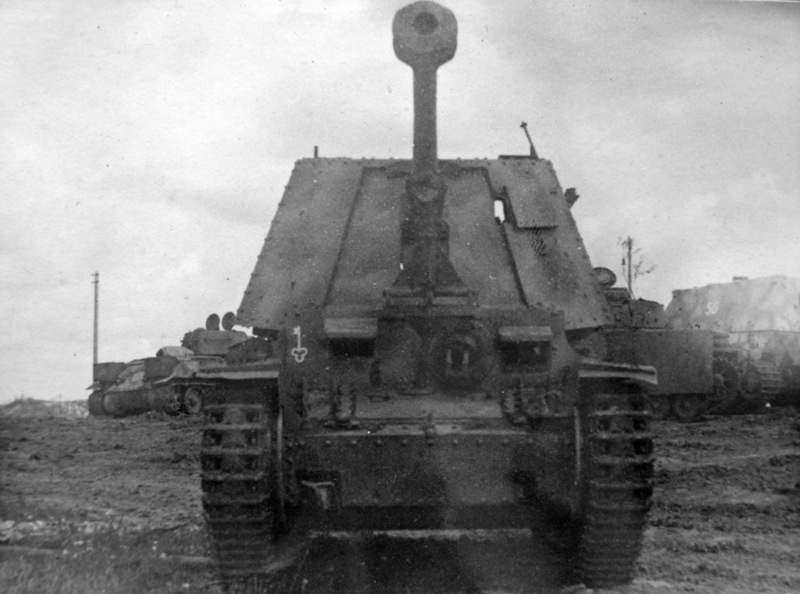 A captured tank destroyer at the NIBT proving grounds, summer 1943. Production of the third batch began in August of 1943. Externally, these SPGs had slightly different hatches in the driver's compartment. In addition, some vehicles received more powerful Praga AC engines. The top speed increased to 47 kph thanks to this 150 hp engine. In total, 344 Pz.Sfl.2 für 7,62 cm Pak 36 were built between the three batches, with chassis numbers between 1360-1479 and 1527-1750. Production of SPGs of this type did not end here. Starting in February of 1943, Pz38(t) tanks that returned from the front were converted. About 30 vehicles were made this way. The Pz.Sfl.2 für 7,62 cm Pak 36 began to enter service in May of 1942. Unlike PzII SPGs, these vehicles were sent to tank divisions, not tank destroyer battalions. An exception was the 521st Tank Destroyer Battalion, where 12 vehicles were sent on May 27th, 1942. A tank division usually received a battery of 6 SPGs. There were, however, cases where a division received 9 (18th TD) or 12 (8th and 19th TDs) SPGs. One of the first recipients were the 15th and 21st Tank Divisions, which were fighting in North Africa. Later, 39 tank destroyers of this type were sent to North Africa. The trend of sending the Pz.Sfl.2 für 7,62 cm Pak 36 to tank divisions continued after that. The same vehicle from the left. The SPGs first went into battle in July of 1942. Reviews were similar to those that came in for the 7,62 cm Pak 36(r) auf Fgst. Pz.Kpfw.II(F) (Sfl.). First of all, they had to do with the gun, or rather its height. The tall vehicle made an excellent target, and the bulletproof armour offered little protection. Many complaints were made regarding the location of the ammunition. At certain traverse angles, the gun and shield covered the ammunition racks. Many complaints were made about the travel lock as well. There was also positive feedback. The armour piercing shell confidently punched through the front of a KV-1 tank from 350 meters, and this was not the limit. A negative feature of the gun was the muzzle brake, which kicked up a cloud of dust during firing. A major difference from the reviews of the 7,62 cm Pak 36(r) auf Fgst. Pz.Kpfw.II(F) (Sfl.) was that there were few complaints regarding the reliability of the vehicle. Complains came in regarding the weak leaf spring mounting, the occasional transmission breakdown, and poor traction. According to reviews, the vehicle was mobile, had a good suspension, and did not make much noise. Significant issues were only faced in North Africa. Despite the conversions made for hot climates, the vehicles were ill-suited for this theater. The engines suffered the most, and broke down often. A photo from the rear shows the fighting compartment. The finale of the 1942 campaign had a direct impact on the number of Pz.Sfl.2 für 7,62 cm Pak 36. 94 vehicles of this type remained in the Wehrmacht by June 30th, 1943, 8 of which were undergoing repairs. In July of 1943 they were renamed Panzerjäger 38 7,62 cm Pak 36 and received the index Sd.Kfz.139. Only 38 vehicles survived until the end of the year, when they were named Marder III. This name was used very infrequently. These SPGs lasted until the end of the war. As of January 22nd, 1945, 23 of these SPGs were listed as still in service. Only two remain to this day. One is in Fort Lee, USA, and the other can be seen in France, in the Saumur tank museum. 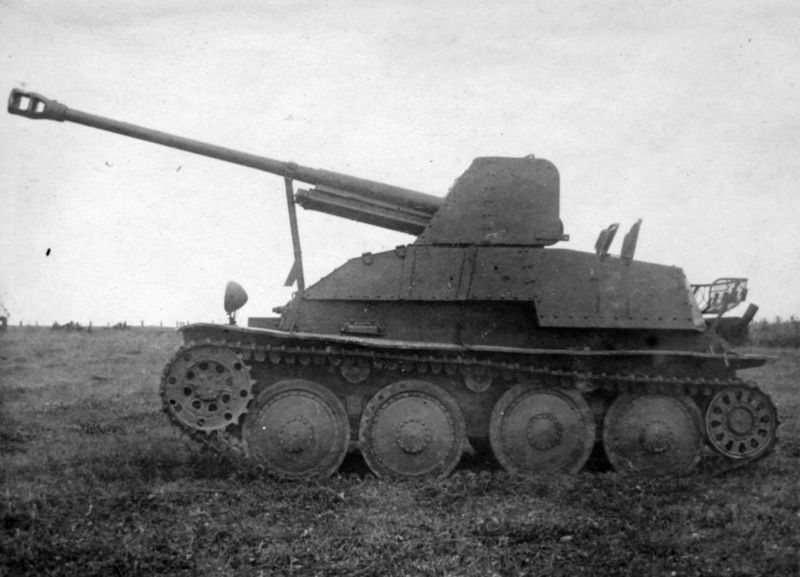 Using the Pak 36(r) as a main weapon of tank destroyers was a half-measure. The biggest issue with this gun was that the number of available guns was limited. Production of the F-22 ended before the war, and no new batches of trophies could be expected. The Germans understood this perfectly, and the question of rearming the Pz38(t) tank destroyer was raised in early March of 1942. 7.5 cm Stu.Kan. auf Pz.Kpfw.38(t). This project did not move past the production of a prototype. Interestingly enough, the first choice was not an anti-tank gun. On March 8th, 1942, Hitler proposed the installation of the 75 mm StuK 40 L/43 on the Pz38(t) chassis. Preparation for production of the StuG 40 Ausf F armed with this gun were underway. The idea was reasonable, as the StuK 40 had more compact recoil elements. And so, the 7.5 cm Stu.Kan. auf Pz.Kpfw.38(t) was born. The chassis was developed by BMM, and the gun by Alkett. Unlike the Pz.Sfl.2 für 7,62 cm Pak 36, the SPG had a much larger gun shield, which was much more effective at protecting the crew. The vehicle also retained the stock driver's compartment hatches. However, the 7.5 cm Stu.Kan. 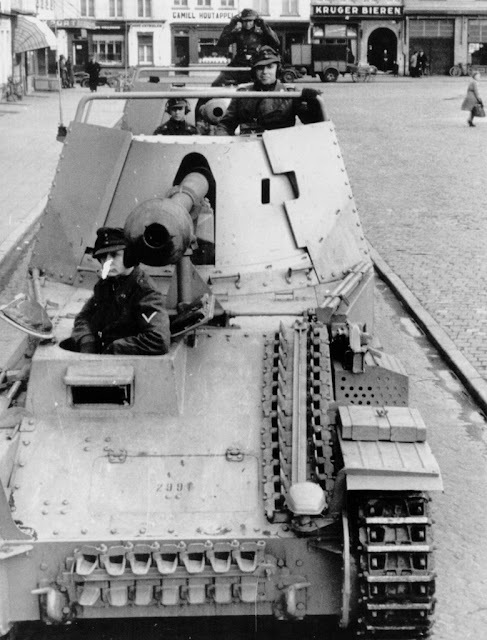 auf Pz.Kpfw.38(t) never saw mass production. It turned out to be easier to use the slightly more powerful Pak 40 gun. On May 7th, 1942, at the same meeting where Hitler questioned the further production of the Pz38(t), he also raised the issue of producing a tank destroyer armed with a 7.5 cm Pak 40 gun. Calculations showed that there would be no issue with installing this gun. 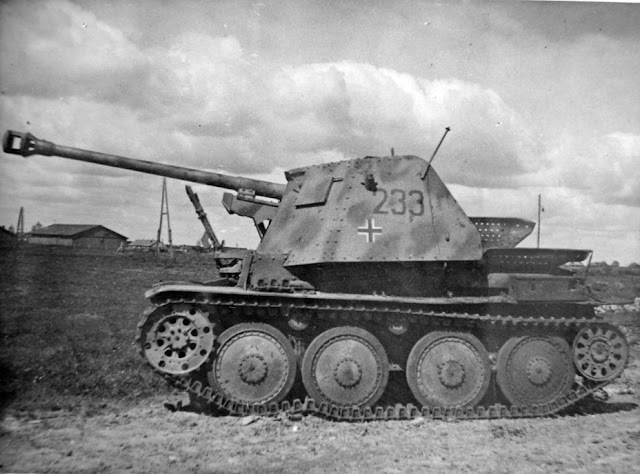 A prototype of the vehicle named 7.5 cm Pak 40 auf Pz.Kpfw.38(t) passed trials in Milovice by the end of June. Production 7.5 cm Pak 40 auf Pz.Kpfw.38(t). The photo shows how the tarp was attached. The layout of the chassis, also referred to as Sfl.38, was radically different from the previous SPG. 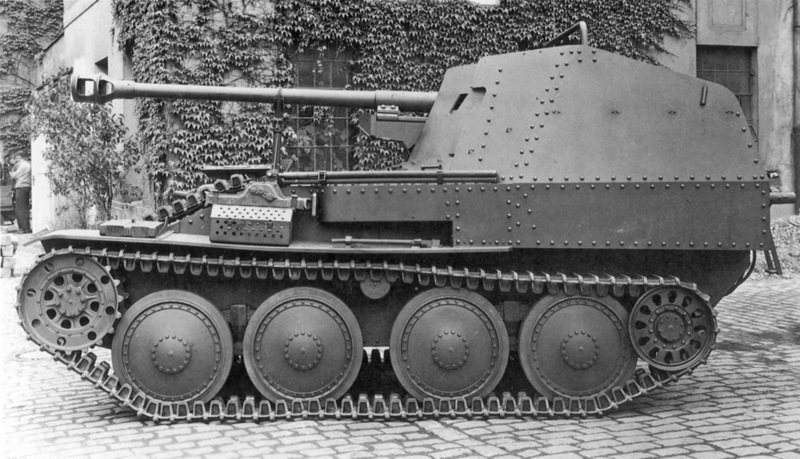 On one hand, it was also built with the requirement to avoid changes to the Pz38(t) chassis. The turret platform was also preserved, sans roof. On the other hand, the fighting compartment was completely different. Instead of a mobile shield, a casemate was installed, open from the rear and partially from the sides and the top. This design was much more effective at protecting the crew from small arms fire. The mount used in the Pak 40 remained, but was reduced in size. The amount of ammunition carried increased to 38 rounds. In addition, extra crates could fit on the platform installed above the engine compartment. The platform was built in such a way that it did not impede the servicing of the engine. Instead of large seats, the commander/gunner and loader received small ones. The new vehicle did away with the driver and radio operator's hatches. This change in the layout allowed the mass to remain at the previous level. The height of the vehicle was the same (2.5 meters), but the bore axis height was lowered to 1.96 meters. The layout of this vehicle was superior to the Pz.Sfl.2 für 7,62 cm Pak 36. The German brass was satisfied with the new SPG. The first 24 vehicles were planned for August of 1942, but the plans had to be moved down. 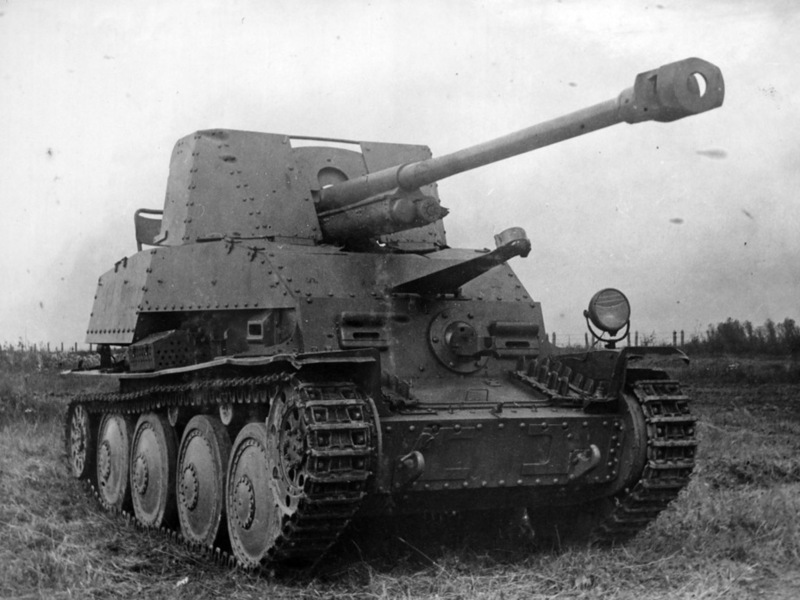 Production of the third batch of the Pz.Sfl.2 für 7,62 cm Pak 36 began at that time, which meant that new production could not start until November. The delay was beneficial for the new SPG, since it meant that all new vehicles were built with the more powerful Praga AC engine. 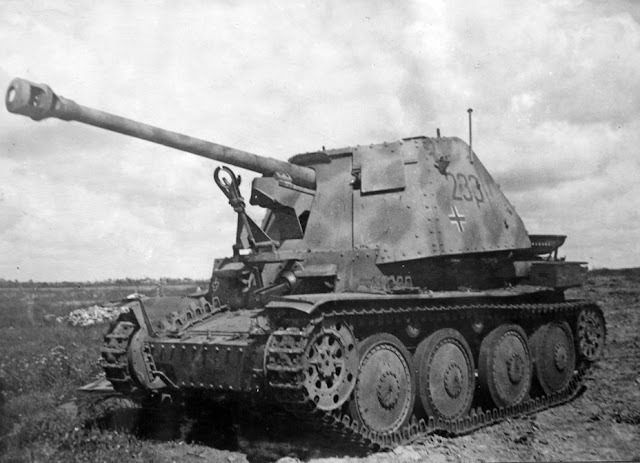 Production of 50 7.5 cm Pak 40 auf Pz.Kpfw.38(t) was planned for the first month, but only 42 were accepted in reality. The difference was made up in December, when BMM put out 68 SPGs. An SPG that was made via conversion of a refurbished Pz38(t). 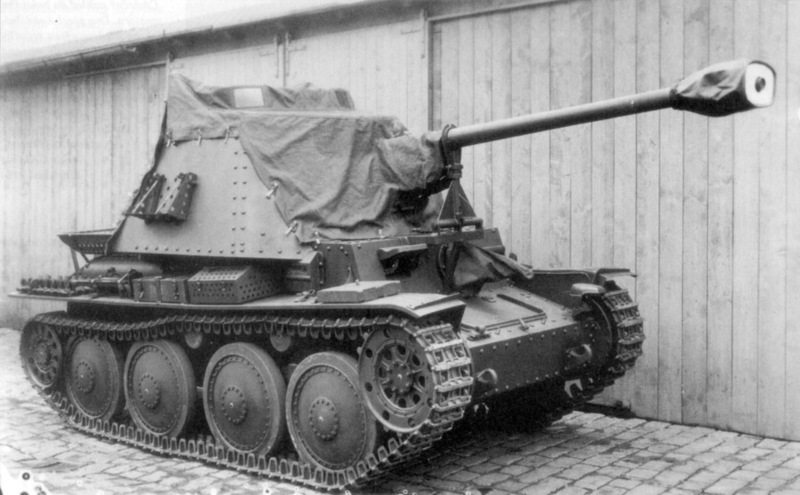 The age of the 7.5 cm Pak 40 auf Pz.Kpfw.38(t) was a short one. The last 6 SPGs of this type left BMM in May of 1943. In total, 275 vehicles of this type with chassis numbers in the 1751-2075 and 2121-2147 ranges. Conversion of refurbished Pz38(t) vehicles also began in May. 175 tanks were converted this way. 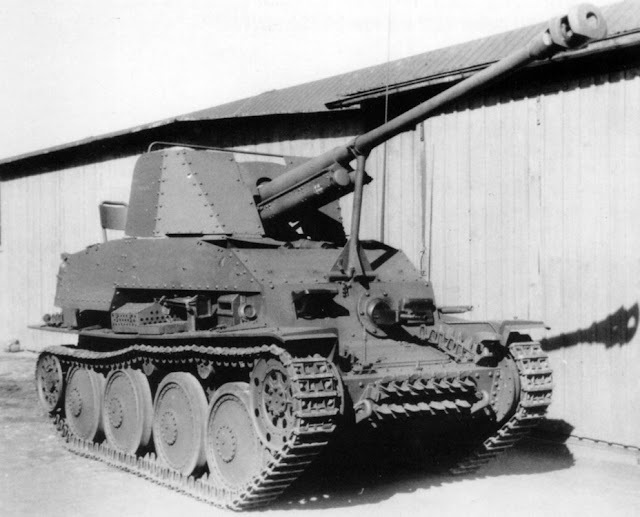 A captured 7.5 cm Pak 40/3 auf Sfl.38 (Ausf.H). NIBT proving grounds, summer 1943. These SPGs entered service in January of 1943. The shipments were irregular, and often happened as a part of reinforcements. Initially tank units had priority, but the situation changed in the spring of 1943. Losses led to the SPGs, renamed 7.5 cm Pak 40/3 auf Sfl.38 (Ausf.H) in May of 1943, were sent to independent tank destroyer battalions (559, 616, 731, 742, 743, 744). The number of incoming vehicles was irregular. The 731st battalion received 36 SPGs, more than anyone else. The others got 13 to 16 SPGs. These vehicles were also used in tank destroyer battalions that were a part of infantry divisions. The same vehicle from the left. The crew is reliably protected from bullets and shrapnel. Reviews from the front lines were similar to those for the Pz.Sfl.2 für 7,62 cm Pak 36. The fact that the Wehrmacht was not doing too well in February of 1943 influenced the impression that the 7.5 cm Pak 40/3 auf Sfl.38 (Ausf.H) left. By this point, the Germans were defending instead of attacking. The Red Army retained the initiative until March of 1943. In addition, the StuG 40 Ausf. G began entering service en masse. 197 Stug 40 Ausf. G were built in March of 1943, and 260 in May. Certainly, the 7.5 cm Pak 40/3 auf Sfl.38 (Ausf.H) was better than a towed Pak 40, but the vehicle had a tall silhouette and not the thickest armour. Compared to that, the StuG 40's 80 mm of front armour and low profile made it look much more appealing. The same vehicle from the front. The unit emblem is visible. 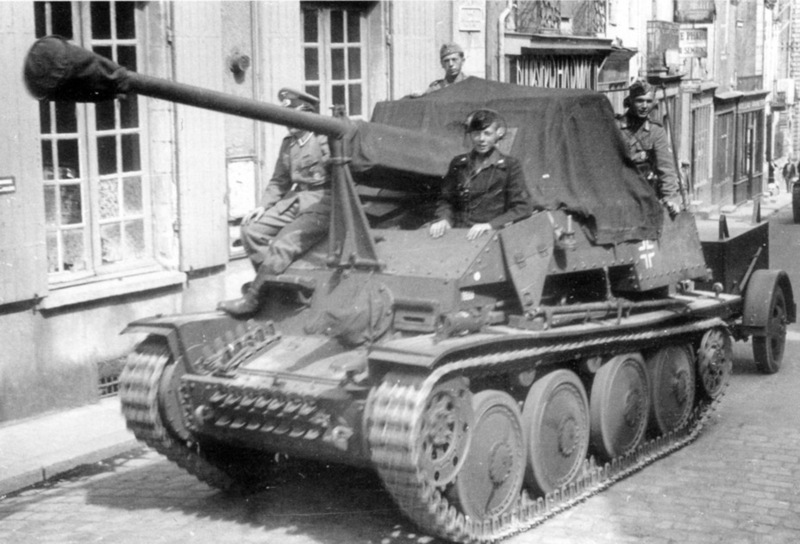 173 7.5 cm Pak 40/3 auf Sfl.38 (Ausf.H) were in service on June 30th, 1943, 10 of which were undergoing repairs. These vehicles participated in Operation Citadel, which had a great impact on their numbers. It's hard to say how many vehicles survived until the end of 1943, as they were lumped in with later models. This vehicle was renamed 7 times during its service. The last name used was 7.5 cm Pak 40/3 Sfl. Marder 38T with the index Sd.Kfz.138. Two SPGs of this type survive to this day: one in the museum in Sinsheim, Germany, the other in Trieste, Italy. A positive experience in converting the PzII Ausf. F into the leFH 18/2 (Sf) auf GW II inspired a similar conversion of the Pz38(t). BMM received an order for the development of the Motor vorn SPG in February of 1943. The layout of the chassis was similar to that of the GW II. The engine and cooling system were moved to the front, and the driver's compartment was drastically reduced in size. The radio operator was removed, and the driver received a separate cabin. Moving the engine compartment forward allowed the creation of a roomy fighting compartment in the rear, which fit three crewmen: the commander, the gunner, and the loader. Initial production 7.5 cm Pak 43/3 auf Sfl.38 (Ausf.M) Motor vorn. This vehicle has distinctive rear fenders, which were later deleted. The gun mount was also similar. The oscillating part of the Pak 40/3 was installed on a mount above the engine compartment. This solution freed up some room, but caused a heap of problems. To reach the engine, one had to first remove the front plates of the casemate, then the gun, and then the mount. However, these problems were tolerable, since the benefits of this layout were worth it. The thickness of the armour was also sacrificed to reduce mass. As a result, the mass grew, but not by much, only to 11 tons. Main production batch vehicle, 1943. The resulting chassis was accepted. The German army finally received a tank destroyer where the commander only had one job. In addition, the improved layout of the fighting compartment finally allowed easy access to the ammunition. It's not surprising that the production of the vehicle, named 7.5 cm Pak 43/3 auf Sfl.38 (Ausf.M) Motor vorn, began in May of 1943. 20 vehicles were delivered in the first month of production, 45 in June, and 90 in July. This made it possible to stop production of vehicles on the PzII chassis and focus on the more in-demand leFH 18/2 (Sf) auf GW II. 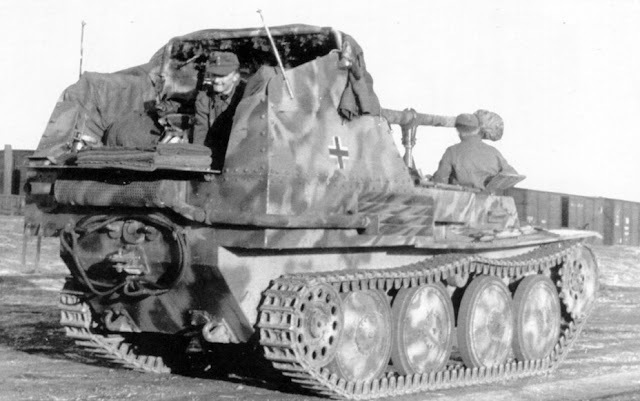 The name of the vehicle was changed to Panzerjäger 38 by the end of the summer, with the index Sd.Kfz.138. As for the name Marder III that is widely used in modern literature, it was first used in November of 1943. However, the classification did not differentiate between the Marder III Ausf. H and Marder III Ausf. M. No such index was ever used. The same vehicle from the front. The serial number on the front plate suggests that it was built in May of 1943. Various changes were made to the design during production. The Praga Ausf.IV 180 hp engine was used starting in July of 1943. During its service, it turned out that it suffered from poor reliability. The solution was to replace it with the 160 hp Praga Typ NS in November of 1943. It was less powerful, but more reliable. A commander's version with additional radio equipment was introduced in the summer of 1943. Its installation reduced the ammunition capacity by 26 rounds. The biggest change to the design of the Panzerjäger 38 happened in November of 1943. By that time, BMM had finally mastered welding, and the driver's cabin and hull became welded. The fighting compartment casemate was still assembled with rivets. A redesigned layout allowed the creation of a fighting compartment for three crewmen. 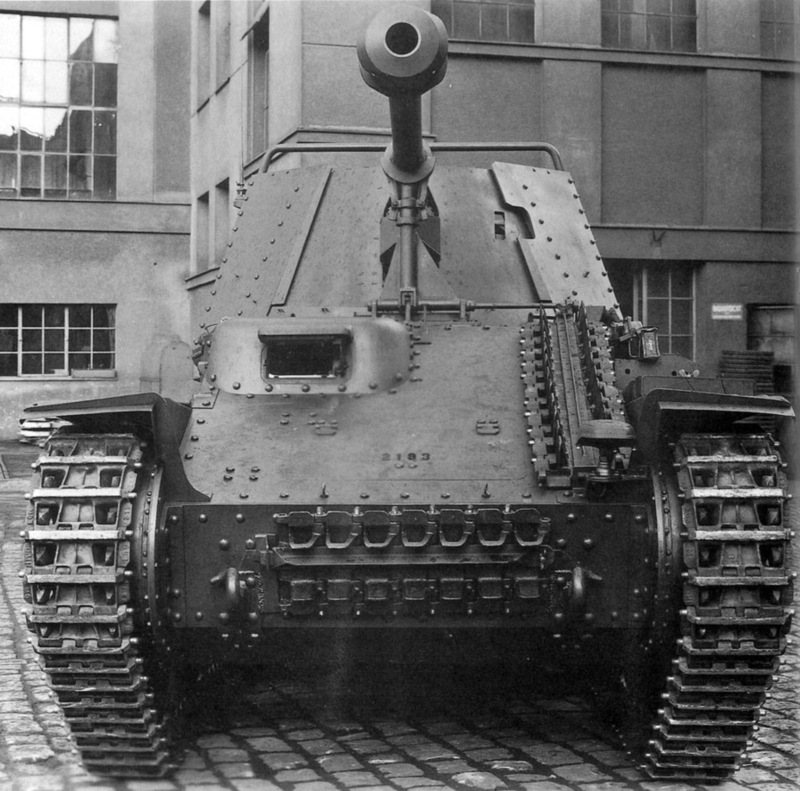 The Panzerjäger 38 became the second most common German tank destroyer. 634 vehicles of this type were built in 1943. Potentially BMM could have built more, but the chassis was used in other SPGs starting in late 1943. It's not surprising that the production numbers began to drop. The peak of production was reached in October, when BMM produced 141 vehicles. Production numbers dropped to 75 in December, and remained around 60-70 until the end of production. The last 46 SPGs were built in May of 1944, when BMM switched to production of the Jagdpanzer 38(t). Unlike its predecessor, the Panzerjäger 38 was primarily used by infantry divisions. In part, this was because the tank units were already saturated with vehicles of this class. These SPGs were only given to tank divisions in September of 1943. Shipments were erratic, partially due to the fact that vehicles were delivered as a part of reinforcements. This is how the tarp was affixed on the Panzerjäger 38. The new SPGs appeared on the front lines towards the fall of 1943. Their characteristics differed little from those of the previous tank destroyers on the Pz38(t) chassis, and the reviews were also similar as a result. Most complaints had to do with the driver's station. Visibility left much to be desired, and water got inside during rain. The tight layout of the SPG caused complaints regarding the difficulty of service. Welded casemates were introduced in November of 1943. Another issue had to do with improper use of the SPGs. One often hears about how SPGs were used like tanks in the Red Army. German infantry often treated their SPGs in the same way. Considering the large silhouette and thin armour, it's not hard to predict the results of this use. Nevertheless, there were quite a few vehicles still in service by the end of the war. 277 were in service as of December 30th, 1944, plus 62 in repairs. 118 remained on March 15th, 1945, plus 51 in repairs. Of this number, only 4 Panzerjäger 38 remain to this day. The chassis was also welded. The concept of a light self propelled gun mount proved itself. However, it's hard to claim that German and Czech engineers managed to find an optimal solution. The aim to retain the chassis without serious changes led to a number of serious drawbacks in even the reworked design. The SU-76M, the closest Soviet analogue, was much better. 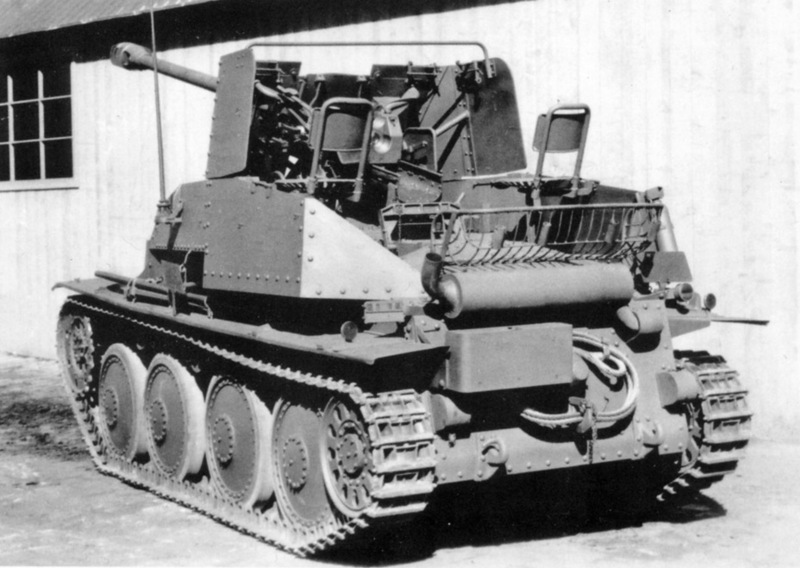 This vehicle also used light tank components, but the chassis was designed nearly from scratch, with the requirements of an SPG in mind. 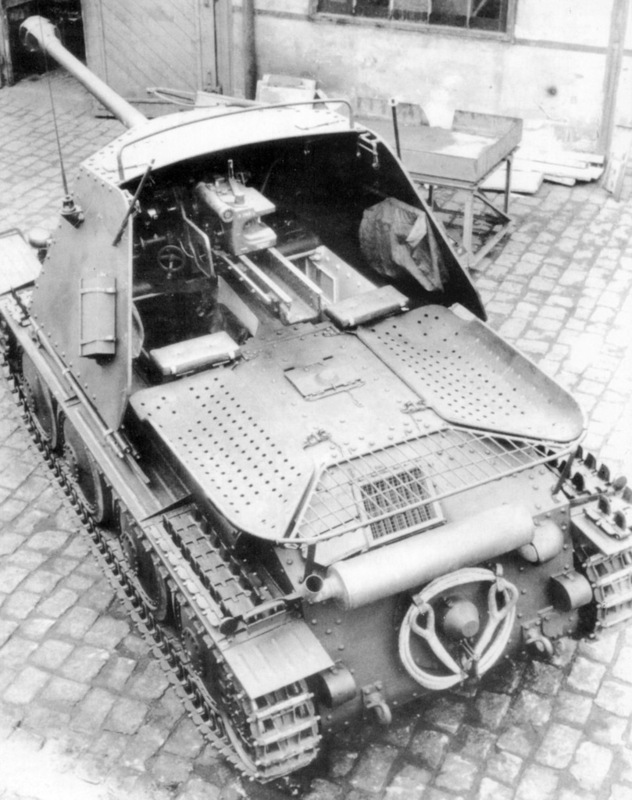 Soviet designers ended up with a vehicle that was inferior to the Panzerjäger 38 in penetration and top speed, but better in every other respect. The SU-76M was lower, more stable during firing, had a roomier fighting compartment, and the visibility of the driver was better. In addition, the Soviet vehicle was much simpler to service. Original article by Yuri Pasholok.